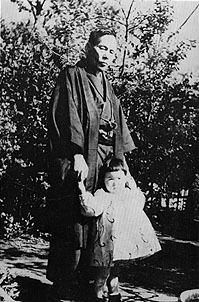 President Makiguchi with his wife. 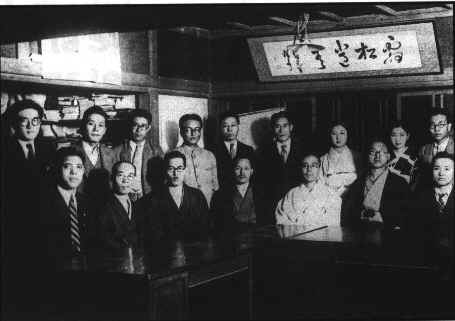 An early pre-World War II photo of the Soka Kyoku Gakkai. Mr. Makiguchi is at first row, center. 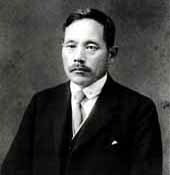 To learn about the life of Makiguchi and how he founded the Soka Kyoku Gakkai, go to http://www.sgi-usa.org/thesgiusa/aboutsgi/makiguchi.html. 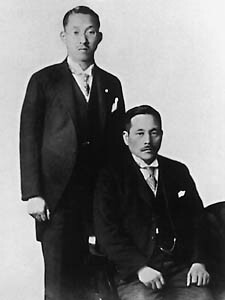 A paper by Daisaku Ikeda entitled "John Dewey and Tsunesaburo Makiguchi: Confluences of Thought and Action" may be found at http://www.siu.edu/~deweyctr/makiguchi.html, which is the Center for Dewey Studies website. At the Encyclopaedia of Philosophy of Education website, http://www.educacao.pro.br/tsunesaburo.htm, there is a scholarly paper about Makiguchi's theories on education. An article about the Brazilian "Makiguchi Project in Action –– Enhancing Education for Peace" is available at http://www.educacao.pro.br/makiguchi.htm.